In yesterday’s post, I looked at Ombra, a self-striping yarn from An Italian Story premium yarn collection. Well, this is it, the last chapter of An Italian Story by Red Heart. Today, I’m writing the chapter of Vera, a luxurious blend of 70% wool and 30% alpaca in a bulky weight yarn. This is Vera in Melanzana, which is Italian for eggplant. It’s not as deep a purple as the eggplants in my grocery store, but it is a very pretty purple. If you remember back to my post about Ora, we did a little Italian lesson with the colors of the yarn. Vera is appropriately named, as it means “real” in Italian. Vera is made from real, natural fibers, and it is the real deal at about $12 per 100g ball (at time of writing). Many of the colors we learned in the bulkier Ora are also offered in Vera: Latte, Nero, Notte, Pietra, and Rosa. 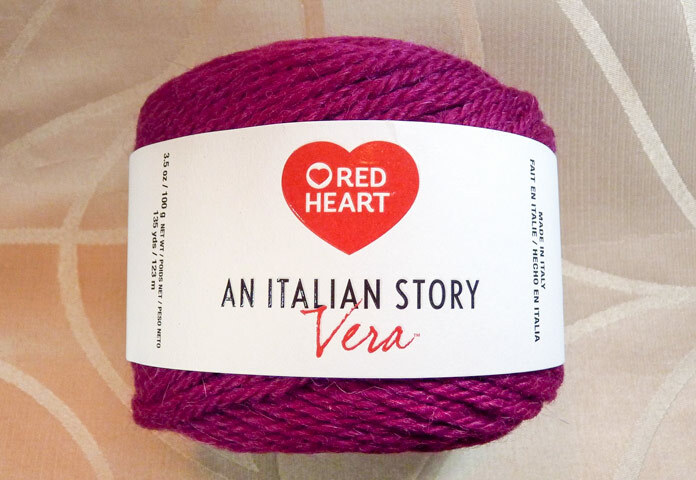 Vera’s other colors are Melanzana, a deep purple named after a ripening eggplant, Caffe, the color of coffee with a little cream in it, and Salvia, which, translated to English is sage, and it is an aptly-named, soft green. A photo showing the twist of Vera in (top to bottom) caffe, melanzana and rosa. When I went looking for pattern support for Vera, I found the Duo Scarf, which you could make in just one color instead of the two given (two balls each of Pietra and Melanzana) and the Tondo hat, which is made of one ball each of two colors (shown in the pattern with Latte and Nero). 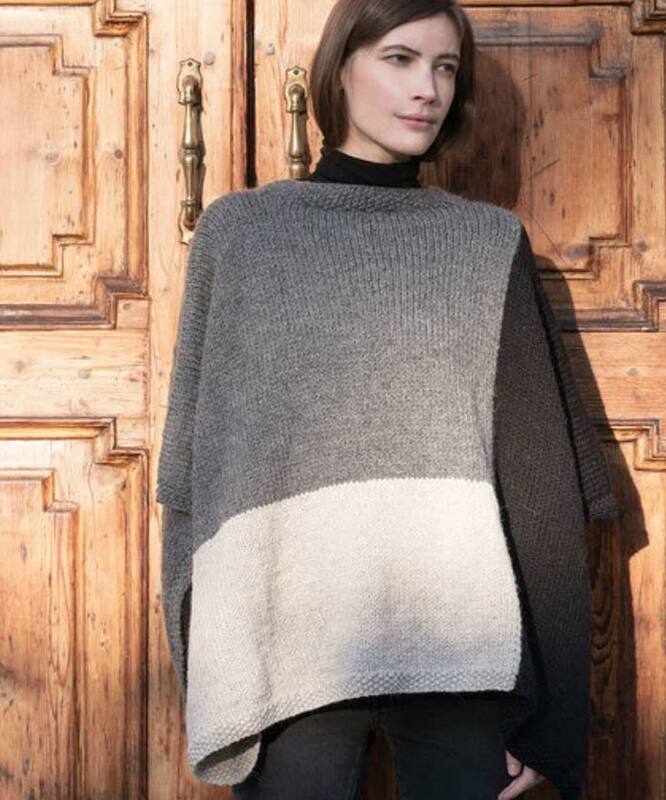 But I really fell in love with the Valle Poncho, a fashion-forward, colorblock poncho. I can SO imagine this poncho done with Rosa where the Latte is in the photo, Caffe where the Pietro is (upper left in the photo) and the Melanzana down the right side! I’ve been looking for a new piece to replace my old, purple, triangular poncho that I designed years ago, and this would be terrific. The back of the Valle poncho does not have the light color block on the back, but if I put it in, I actually have enough yarn on hand to make this! I love the seed stitch borders, and the only change I would make to the pattern would be to widen the outside ones. I’d leave the neckline the same. A colorway comes together! 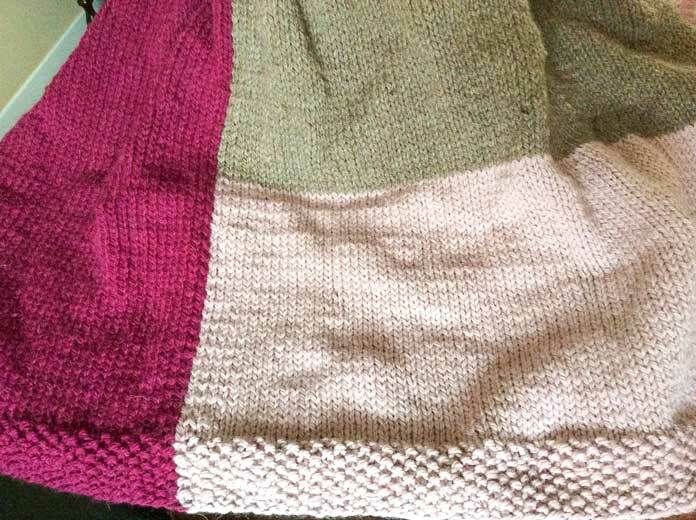 I somehow managed to reverse the blocks in my poncho, but this combination of Melanzana (left), Rosa (bottom right) and caffe (top right) is quite pretty. If you look closely, you’ll see that I pretty much doubled the seed stitch border. So, as I bring our Italian Story to a close, I’m knitting into the sunset on my Valle poncho. I mean literally knit into the sunset: by the time you read this, I’ll have flown to Australia and New Zealand and back!